In fact, it is a lot less about a New Year’s resolution than it is about maintaining a generally healthy lifestyle, for which I continue to strive. That’s the reason I was jazzed when I ran into a neighbor and a friend at the grocery store recently. If you’ve been a regular reader of “The Single Father’s Guide Blog” or if you are one of the tremendously fortunate people who actually have a copy of The Single Father’s Guide to Life, Cooking, and Baseball, then you are familiar with a term I coined platonic female friend (PFF), for the ladies who have often been the wives of my friends and who have supported and helped me during my journey. Nancy is one of those friends. After catching up a little about the kids, jobs, and a few other things, Nancy told me that one of her resolutions for 2017 was to eat healthier and asked if I’d tried Pasta Zero. I told her that I hadn’t even heard of it. She showed me the package. After we wrapped up, I walked back to the produce aisle and grabbed a couple. That night, I tried it and, well, I liked it. 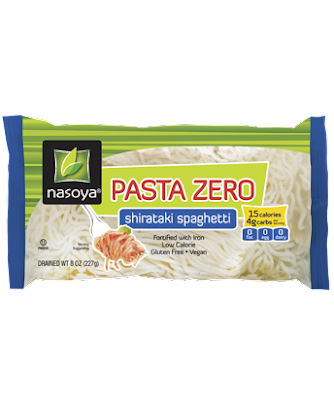 So, Nasoya Pasta Zero isn’t really pasta, so if you’re a pasta aficionado and crave the semolina flavor, well, this isn’t for you. It's "shirataki" pasta. Frankly, I don't know what that means, but, if you’re looking for a very functional and, frankly, reasonable facsimile of pasta that has almost no calories, then this is it. The ingredients include, and this is the entire list, “Water, konjac flour, chickpea flour, potato starch, calcium hydroxide, reduced iron, folic acid” There are four carbohydrate grams per serving and just 15 calories. 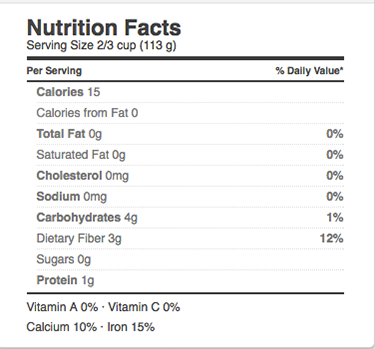 Might as well be zero calories considering the same serving of traditional pasta contains about 30 grams of carbohydrates and 140 calories. For those who suffer from celiac disease or similar ailments, Pasta Zero is also gluten free. I’ve made a couple of packages and tossed with an olive oil, garlic clove, and basil pesto and added chicken breast or shrimp. 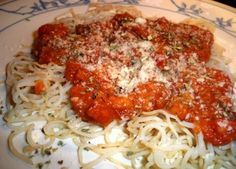 I’ve also just added some pasta sauce and topped with Parmesan cheese. I will admonish the potential Pasta Zero buyers and chefs a couple of things. First, Pasta Zero doesn’t really absorb water. It’s packed in water, so after heating on the stove or in the microwave, make sure the “noodles” or whatever you want to call them, are well drained. Insufficiently drained Pasta Zero may result in watery sauce. Second, Pasta Zero isn’t cheap. While you can buy a one pound package of traditional pasta on-sale sometimes for less than a dollar, I’ve bought Pasta Zero at two different grocery stores; the retail price is $2.58 per package and I’d estimate that it would require at least two Pasta Zero’s to equal a cooked one pound package of traditional pasta. Still, if you’re looking for a healthy alternative to the wheat-based, high carbohydrate pasta, Pasta Zero is a great alternative. Thanks for the tip, Nancy. End-Around End to NAFTA to Help American Workers?